Uzbekistan’s veteran dictator, Islam Karimov, has died, leaving central Asia’s most populous country in a state of turmoil and political uncertainty. 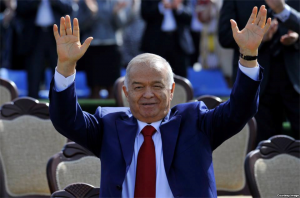 There were few official clues as to how Uzbekistan’s new leader may be picked. All week the state media has refused to comment on rumours that Karimov – who had been in hospital since Sunday – had suffered a brain haemorrhage. His daughter Lola broke the news on Instagram. Karimov has been in power for 27 years, and is “officially” loved by his entire population (because who could say otherwise in a regime with no free speech?) but I suspect also has many legitimate fans. Weirdly enough, I flew out of Tashkent almost a year ago today. Last year, I left just as Uzbekistan was preparing to shut down for its annual National Day celebrations. This year, the celebrations were skipped by most senior officials due to Karimov’s illness. Given the strategic importance of its location — and the degree of messed-up-ness of many of its neighbours — instability or a power vacuum could be really, really messy. Uzbekistan has managed to fend off Russia, China, Turkey, AND radical Islamism of the form that ISIL and the like are trying to spread. All of them, plus a few other players, might view a period of uncertainty as an opportunity to pounce. It’s hard to know what will happen next. But I send best wishes to my friends in Uzbekistan.